(Note: This post first appeared at the Huffington Post on December 8, 2015. One of the reasons I'm drawn to children's literature is that the right book really is a gift that can last a lifetime. For me, one of those books is A Chair for My Mother by Vera B. Williams. So when the sad news of Williams' passing broke this year, I opened up my tattered copy and was immediately hit by a wave of nostalgia. I remembered the feeling of reading that book with my family as a kid. I felt the mother's exhausted posture after a long day of work, the satisfaction when they finally filled their huge jar with coins, and the giddiness of the grandmother giggling as she tried out new chairs. And now, as a father who gets to create new memories by reading that same book to my sons, I have a new appreciation for the term "a gift that keeps on giving." So, while you can't replace a legend like Williams, it seems somewhat fitting that in such a dazzling year for picture books, the one that stood out the most for me wasLast Stop on Market Street, a touching story that carries on the tradition of emotionally honest and compelling family stories that was her trademark. The first time I read this book, its generosity of spirit instantly evoked memories of A Chair for My Mother. Under the guiding influence of his kind but no-nonsense Nana, young CJ learns to see the world around him with greater empathy. So many books for children focus on the power of the imagination, but often in the service of the fantastical or the outrageous. Through de la Peña's deft narrative and Robinson's timeless illustrations, Last Stop on Market Street invites readers to train their imaginative powers on the real world in order to see more deeply and with greater compassion. The delightful Wolfie the Bunny has captured a lot of hearts this year and with Dyckman's perfect comic timing and OHora's distinctively bold style, it's no wonder. For any family, adjusting to a new arrival is a huge adjustment. But like Wolfie, given time the newest addition will win you over... assuming he doesn't eat you all up first. 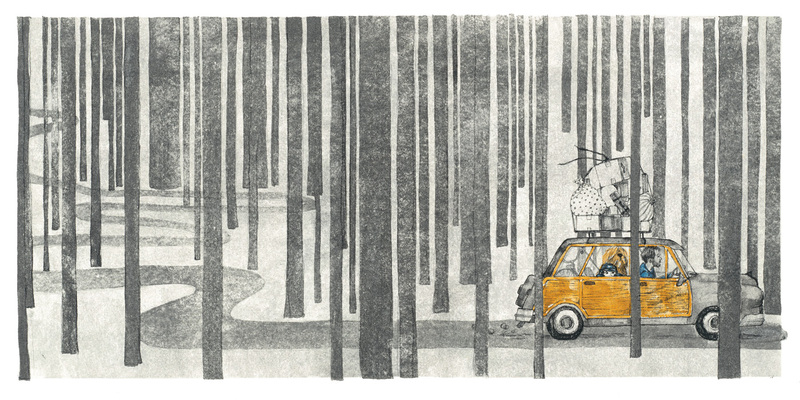 At first glance, In a Village by the Sea appears to be a straightforward story about family, but Van's clever nesting doll narrative and Chu's playful illustration sprinkle the story with a healthy dusting of magic and surprise. Told in a lyrical first person narrative by the prolific Weatherford, Hamer's inspiring life story is further elevated by Holmes' powerful artwork. A fine artist making her debut in children's literature, Holmes' work is both grounding and transcendent, somehow taking the tactile qualities of collage and paint and infusing them with the otherworldly glow of a stained glass window. A fitting tribute to the woman known as "the spirit of the civil rights movement," Hamer's story feels as timely as ever. The title of this book (Enormous Smallness) is perfectly fitting. Many of us think of poems as small things, but as much as anyone, E. E. Cummings showed us that even the smallest stanza could hold enormous meaning. 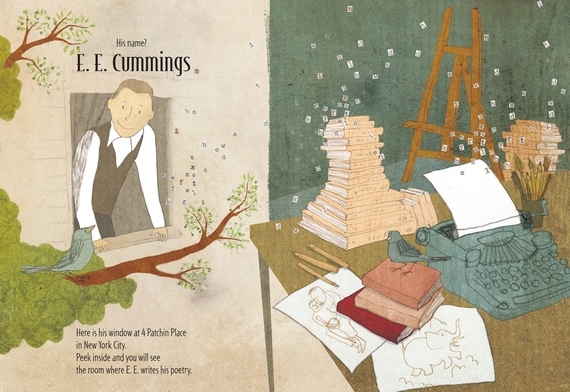 Lovingly written (Burgess is himself a poet) and ingeniously illustrated, this book is a treasure for fans of Cummings, as well as those discovering his poetry for the first time. Sonya raises chickens on her home farm, but following a deadly fox attack, she must learn to cope with loss. With the help of her father's timely storytelling, she receives a valuable lesson about empathy. A warm hug on a crisp morning, Sonya's Chickens isThe Lion King's Circle of Life... minus the soaring orchestral arrangement. Every interaction we have presents us with a choice about how we behave toward each other. Here Nelson (whose artwork is, as always, stunning) presents us with a simple but dramatic reminder about the power of choosing kindness. Following the rainy day adventures of a boy and his newspaper boat, every square inch of this book is a treat. Though drama and disappointment hit when the boy's boat floats away, an uplifting twist leaves readers with their spirits soaring. A book that is ostensibly about mixing colors, this is a true feast for the senses. The first thing I thought of while flipping through this book was Basquiat after a Skittle binge. There is a level of confidence to Esperanza's style that is unique in a debut author -- his control of the page is such that he is unafraid to loosen the reins and let the colors run a little wild. The result is thrilling and hypnotic. Some people can't help but march to the beat of a different drummer, but this is the story of someone who wants to actually be that different drummer. Based on a true story, a young girl dreams of playing the drums despite social norms forbidding her from doing so. Rather than allowing tradition to discourage her, she pursues her dream and through her determination, makes it easier for others to follow their own dreams. Through economical text and luscious illustrations, Hughes captures the daunting challenge (and sometimes despair) of environmental stewardship. However, she ends her story on a hopeful note as the Little Gardener's seemingly futile efforts inspire others to take up the cause. Compared to the limited emotional range of media-darling Grumpy Cat, Bernice is the Meryl Streep of the animal kingdom. Harrison's vibrant art and clever (but not too clever) play on words makes Bernice the perfect companion for any mood. Creative nonfiction at its best. 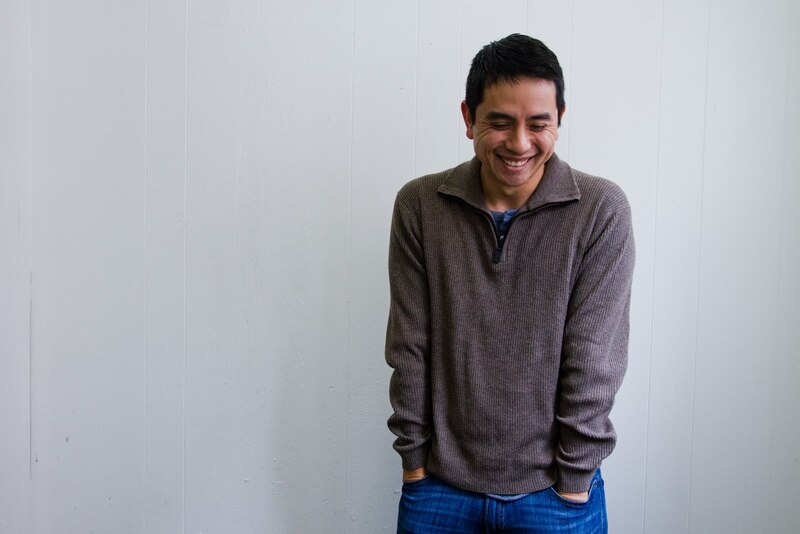 Chin has a confident yet subtle style that brings to mind a modern day Norman Rockwell. 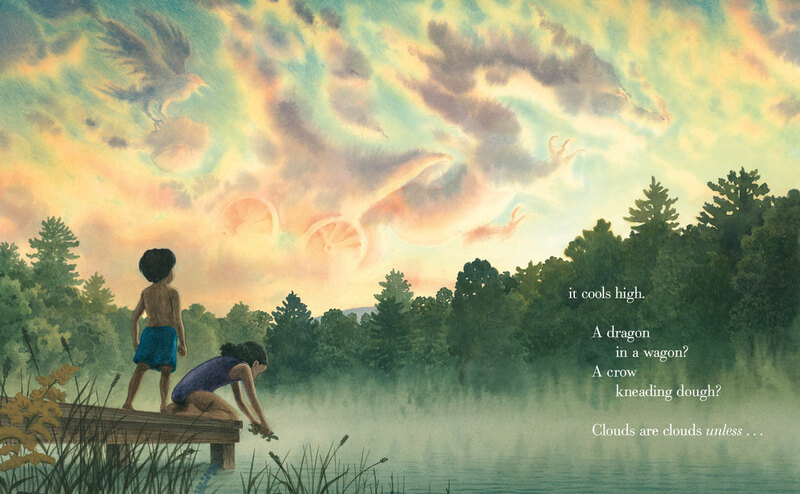 Paired with Paul's rhythmic text, this exploration of the water cycle will not only teach today's children, but will also serve as a useful refresher for older readers as well. 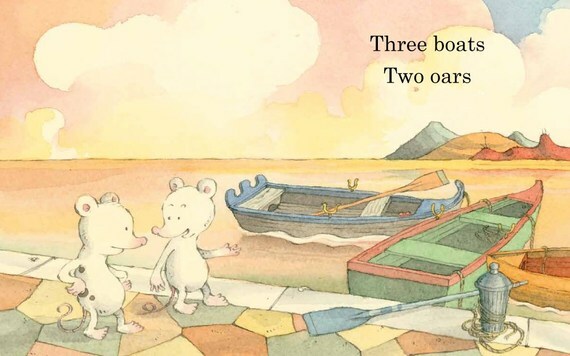 Our book begins with a bear cub and a boy who live together, but when the bear grows too big for the house, the two friends shift into problem solving mode. While the two search for Bear's new home, Henn's keen eye for design and effective see-sawing dialogue ensures that Where Bear? will always have a home at storytime. A story about an imaginary friend that is interwoven with fraying threads of realism, Nino is a refreshing change of pace in the expansive imaginary friend genre. Rendered in scorching earth tones, this Dutch import might be the most visually jaw-dropping book of the year. 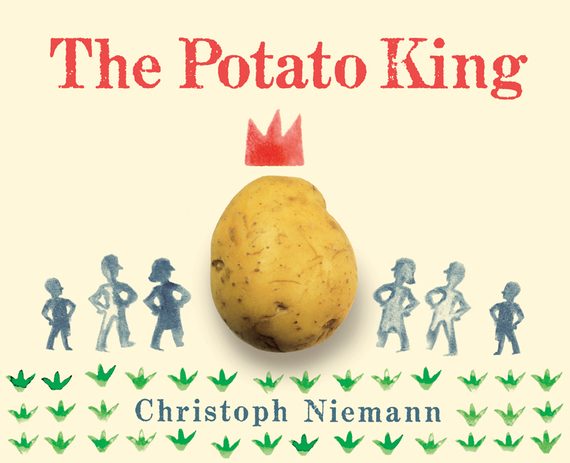 Niemann, an award winning graphic designer, ingeniously uses the overlooked art of potato stamping to tell the (probably apocryphal) story of how King Frederick of Prussia introduced the potato to his country's cuisine. In addition to its delightful design, The Potato King is also a useful study on how to use reverse psychology and behavioral science to get people to eat their vegetables. If you pay attention, you'll find that each year books happen to cluster around particular themes. This year there happened to be a good number of wonderful books featuring the ocean/water, my favorite of which was The Specific Ocean. Like the ocean itself, this book shimmers quietly on the surface but contains an unexpected depth. A valuable reminder that just because you can't take something with you, doesn't mean you have to leave it behind. (Note: There was also a bizarre clustering of books about Yetis this year... but even I couldn't bring myself to create a category forBest Yeti). It's only Stanley. It's only a mystery. It's only a slapstick comedy. It's only science fiction. It's only a love story. 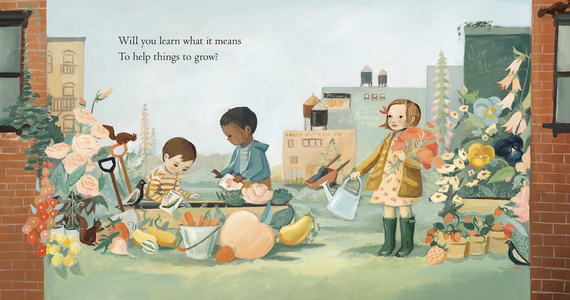 It's only all of these things, which makes it only one of the best picture books of the year. Also, if there were an award for Best Supporting Character, the beleaguered cat in this story definitely deserves it. It's impressive how much personality, drama, and adventure Ruzzier manages to fit into such a seemingly slight book. For a counting book that only goes as high as three, the friendship in Two Mice feels satisfyingly rich and well-developed. Martin didn't just write a book, she took all the hopes and dreams that we have for our children and turned that into a heat-seeking missile aimed straight at the heart. 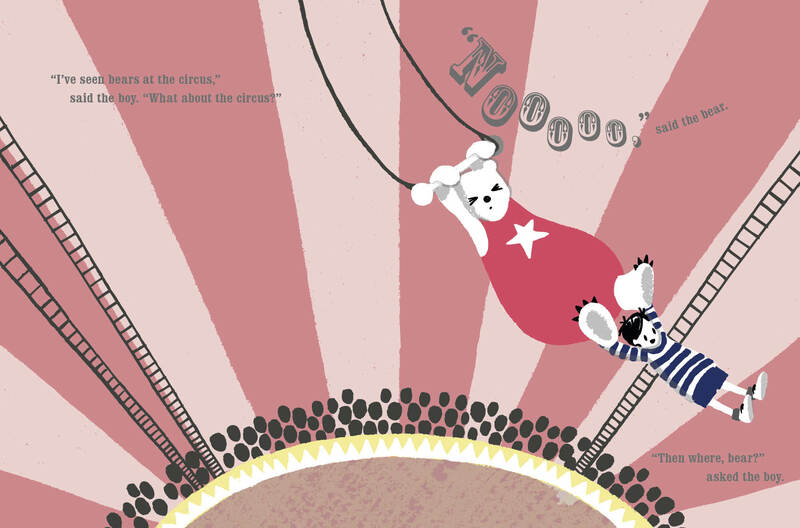 If you're in the market for a baby shower gift, look no further than this stylish book about loving someone no matter who they grow up to be. It seemed appropriate to reserve the "miscellaneous" category for Sadie, a character who defies easy categorization. A young girl who revels in the power of her imagination, Sadie scoffs at silly things like traditional gender constructs. The dynamic duo of O'Leary and Morstad have crafted a quiet but powerful celebration of childhood with a heroine who is a role model for all children. Readers should be prepared to reserve a special place on their shelves -- and in their hearts -- for the incomparable Sadie. For Halloween, Jules Danielson invited Betsy Bird, Travis Jonker, and me to discuss some scary/spooky/wonderful books from the picture book world. Go over to Seven Impossible Things Before Breakfast for the discussion. I hope you enjoy... and that it doesn't keep you up at night! I've been eagerly waiting the moment when I could share some art from our book coming out in June, so a HUGE THANKS to Travis Jonker for revealing the cover to Let Me Finish!... and for the much-too-kind introduction. I can't wait for you all to see the rest of the book. You're going to be blown away by Isabel's art. Also, you can already pre-order from Amazon?! WHAAAAAAAAAAT?!?!?!?!?!?!!!!?!!! A few weeks ago, I was very excited/honored to be invited to Kidlitcon in Baltimore and speak on a panel about Visual Storytelling with the talented Kevin O'Malley, Matt Phelan, and Shadra Strickland and moderated by the dynamic Susan Kusel. As the lone non-illustrator on the panel, it was just a treat to sit back and get a behind the scenes look at their process. 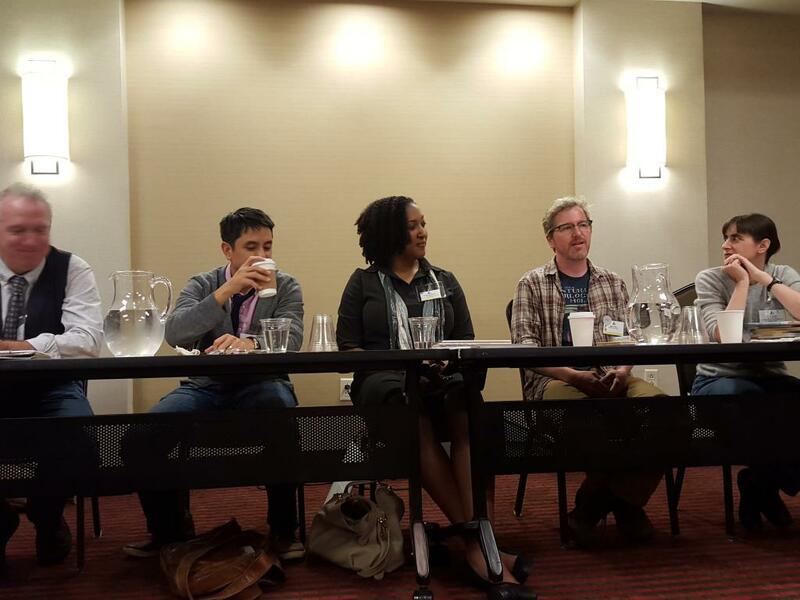 And of course, the whole conference was fantastic. Always great to meet/learn from/drink with so many great people in real life. Much props to Paula Willey, Sheila Ruth, and the rest of the crew for organizing another fantastic event. Can't wait til next time! As far as I'm concerned, 2015 could have closed up shop months ago and it still would have been a landmark year for picture books. Back in February, I said that this year may well prove to be a high water mark for picture books. However, there was no guarantee that the year would continue its torrid pace. But apparently, when it rains, it pours because much to my delight, wave after wave of great books has continued to roll in. As a result, this year's quality of books is matched only by its unfathomable depth. So, prepare to clear some space on your shelves as we dive into some of the best books from the rest of 2015 (in alphabetical order). Bernice Gets Carried Away by Hannah E. Harrison (Penguin): Compared to the limited emotional range of media-darling Grumpy Cat, Bernice is the Meryl Streep of the feline world. Harrison's vibrant art and clever (but not too clever) play on words makes Bernice the perfect companion for any mood. Boats for Papa by Jessixa Bagley (Macmillan): A touching book about love and loss, sponsored by Kleenex (or at least it should be). If this debut is any indication, the prodigiously talented Bagley will have reduced us all to helpless puddles of tears before we know it. The Day the Crayons Came Home by Drew Daywalt, ill. Oliver Jeffers (Penguin): The team behind the runaway bestseller The Day the Crayons Quit is back, this time following the harrowing adventures of lost and forgotten crayons. Like The Godfather II, it's a sequel that not only stands on its own merit, but may be even more colorful than the original. 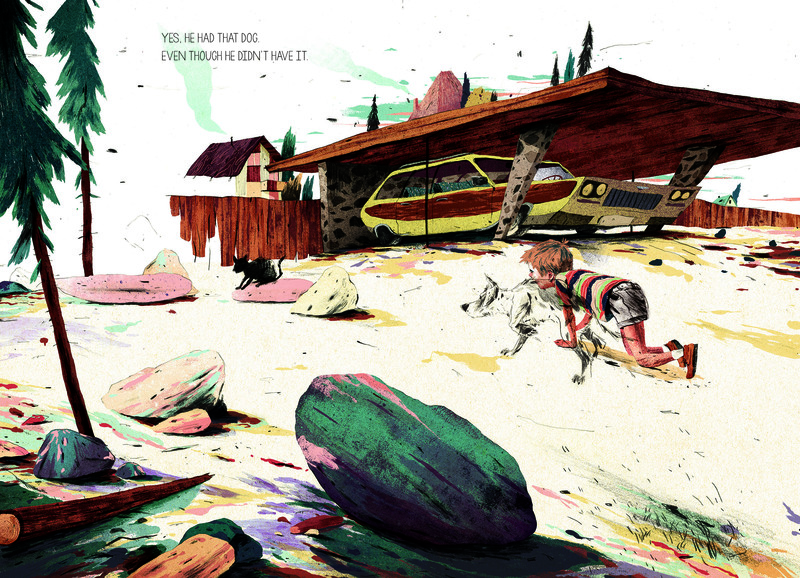 The Dog that Nino Didn't Have by Edward van de Vendel, ill. Anton Van Hertbruggen (Eerdmans): A story about an imaginary friend that is interwoven with fraying threads of realism, Nino is a refreshing change of pace in the expansive imaginary friend genre. Rendered in scorching earth tones, this Dutch import might be the most visually jaw-dropping book of the year. 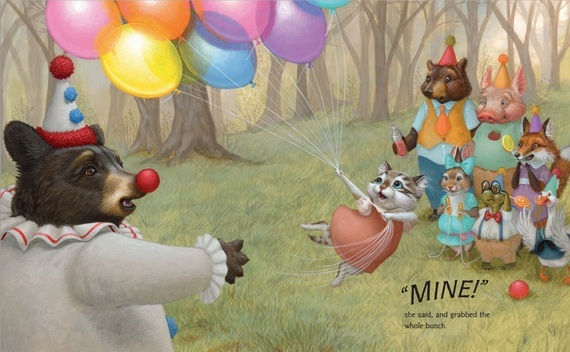 Finding Winnie: The True Story of the World's Most Famous Bear by Lindsay Mattick, ill. Sophie Blackall (Little Brown): Long before the Hundred Acre Wood, there was a Canadian soldier (the author's great grandfather) and his rescued pet bear. And by the way, did you know that Winnie the Pooh was Canadian? Maybe that explains his mild temperament and excellent manners. 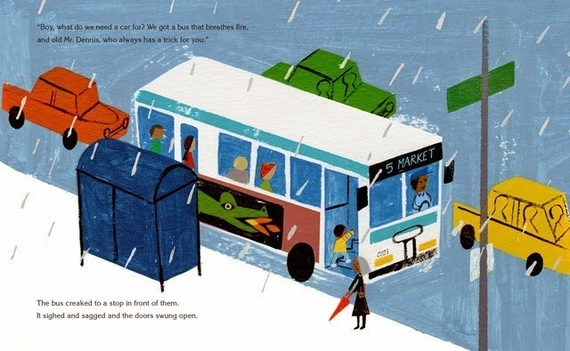 Float by Daniel Miyares (Simon & Schuster): Following the rainy day adventures of a boy and his newspaper boat, every square inch of this book is a treat. The drama and disappointment hit when the boat floats away, but an uplifting twist leaves readers with their spirits soaring. And though it's a minor detail, I appreciated how, while racing down the street after his escaped boat, the boy still takes the time to look both ways before crossing the street. Safety first, people! 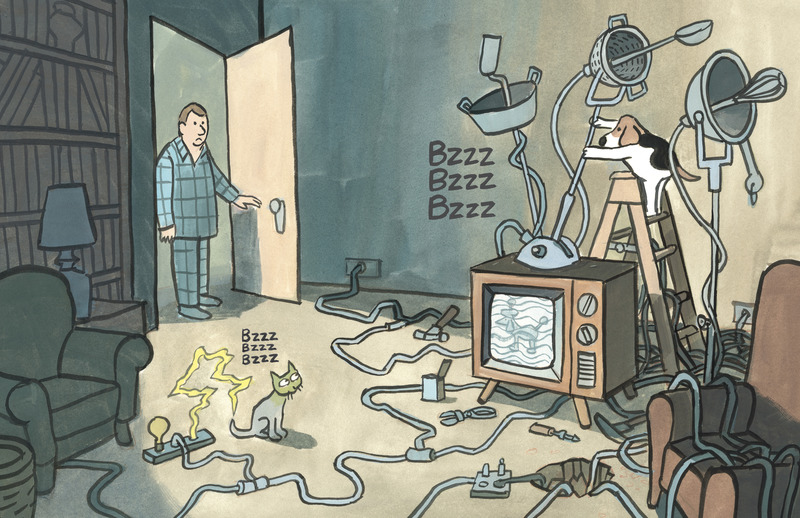 It's Only Stanley by Jon Agee (Penguin): It's only Stanley. It's only a mystery. It's only a slapstick comedy. It's only science fiction. It's only a love story. 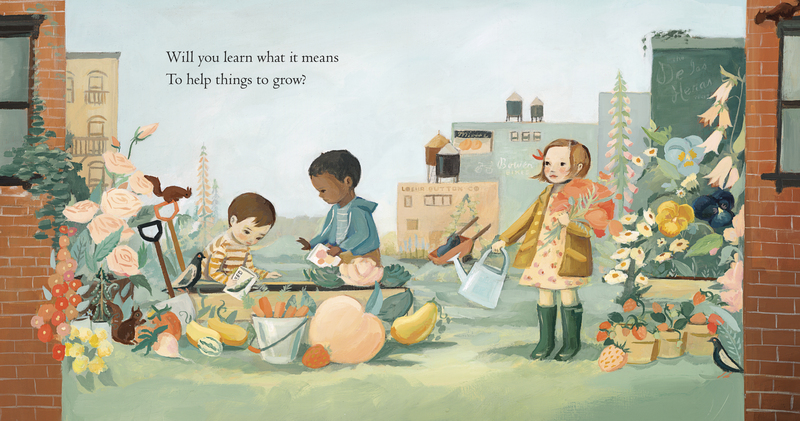 It's only all of these things, which makes it one of the best picture books of the year. The King and the Sea by Heinz Janisch, ill. Wolf Erlbruch (Gecko Press): A charmingly unconventional book, The King and the Sea follows a fumbling monarch through a series of absurd encounters. With wisdom and humor to spare, each of the vignettes (which read like Zen koans) expose the limits of the king's power. By the end, the king realizes that he's better off tossing aside his crown and going for a swim. 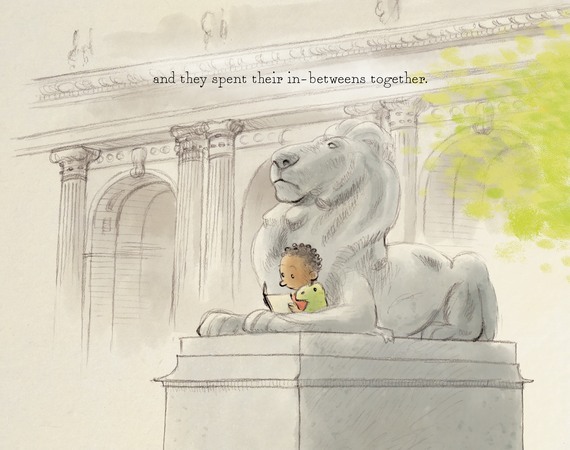 Lenny & Lucy by Philip C. Stead, ill. Erin E. Stead (Macmillan): People often quote FDR's "There is nothing to fear but fear itself," as if that's supposed to be comforting. But FEAR ITSELF?! Now that sounds absolutely terrifying. Lenny & Lucy gets that life isn't always about conquering your fears -- that sometimes, when faced with a threatening darkness, the best you can do is huddle up with a friend. 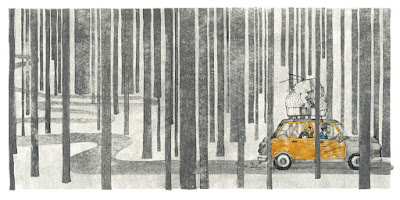 Leo: A Ghost Story by Mac Barnett, ill. Christian Robinson (Chronicle): Despite it being such a strong year for picture books, between this and Last Stop on Market Street, it still wouldn't surprise me if Robinson came away with both a Caldecott Medal and an honor (a rare feat last achieved by Jon Klassen). While his pages are usually bursting with color, here Robinson limits his palette to mostly cool blues, giving Barnett's clever ghost story a chilled but not creepy feel. Little Elliot, Big Family by Mike Curato (Macmillan): In a modern era when people often live so far from their loved ones, Curato hits close to home with a story about creating family wherever and however you can find it. Lizard from the Park by Mark Pett (Simon & Schuster): Pett is a master of quiet illustrations that subtly pack an emotional punch. 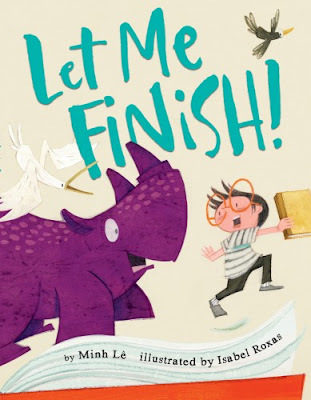 It may seem odd to use the word subtle about a book featuring a boy, his dinosaur, and a daring escape during a New York City parade, but trust me, it's fitting. It's in each of the tiny gestures, perfectly-angled head tilts, and touching in-between moments that the full extent of Pett's skill shines through. That being said, the daring escape is pretty awesome too. 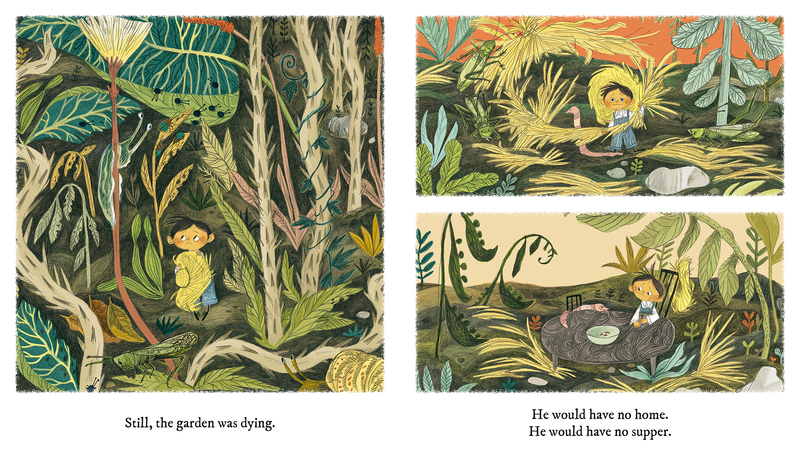 The Little Gardener by Emily Hughes (Flying Eye): Through economical text and luscious illustrations, Hughes captures the daunting challenge (and sometimes despair) of environmental stewardship. However, she ends her story on a hopeful note as the Little Gardener's seemingly futile efforts inspire others to take up the cause. Mango, Abuela, and Me by Meg Medina, ill. Angela Dominguez (Candlewick) Mango is a talking pet parrot, but more importantly he is an ingenious narrative device for a story about language acquisition. 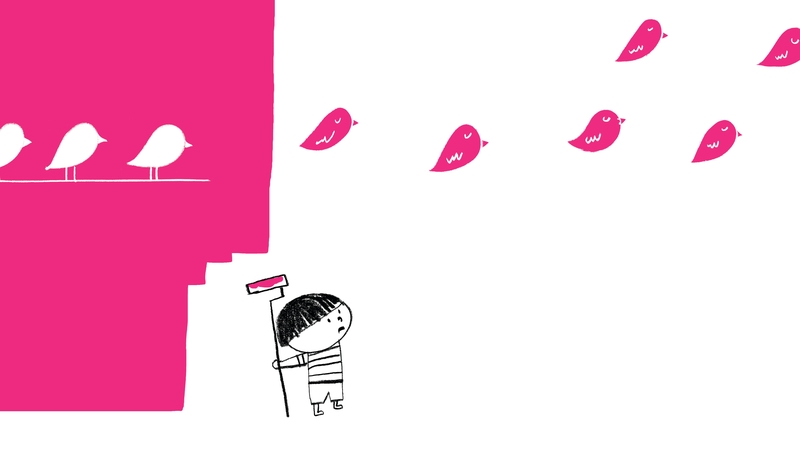 Mia and her grandmother have trouble navigating their language differences, but with a lot of persistence and a little help from Mango, they are able to close the language gap in no time. One Bear Extraordinaire by Jayme McGowan (Abrams): A rambling musician goes in search of a missing element to his song and ends up finding so much more. McGowan's intricate papercut art and playful cast of characters are guaranteed to put a smile on your face and leave you howling with delight. 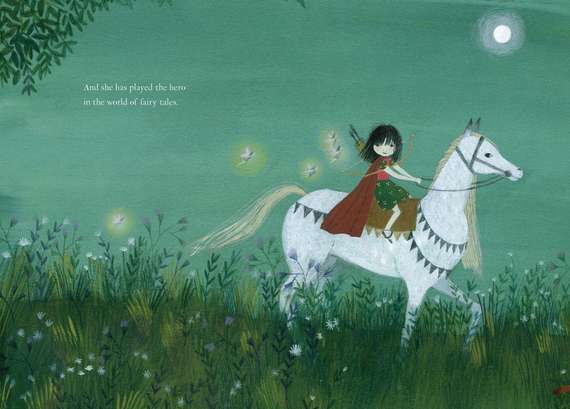 The Princess and the Pony by Kate Beaton (Scholastic): A multiracial warrior princess from the creator of Hark! A Vagrant? Sign me up! Red, Yellow, Blue (And a Dash of White, Too!) by C.G. Esperanza (Sky Pony): A true feast for the senses, the first thing I thought of while flipping through this book was Basquiat after a Skittle binge. 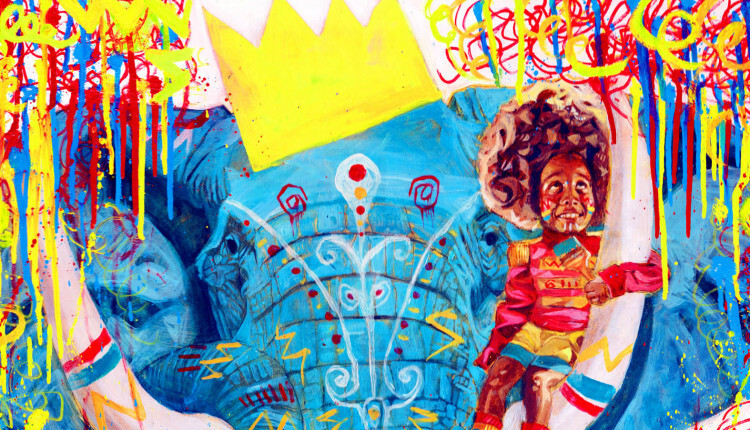 There is a level of confidence to Esperanza's style that is unique in a debut author -- his control of the page is such that he is unafraid to loosen the reins and let the colors run a little wild. The result is thrilling and hypnotic. 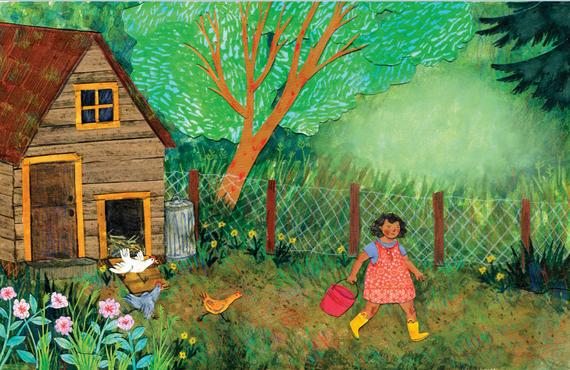 Sidewalk Flowers by Jon Arno Lawson ill. Sydney Smith (Groundwood): On a walk with her father, a girl quietly picks stray flowers along the way. As they navigate the city, she gives away the flowers, adding much-needed color to the drab landscape and leaving traces of beauty and compassion in her wake. 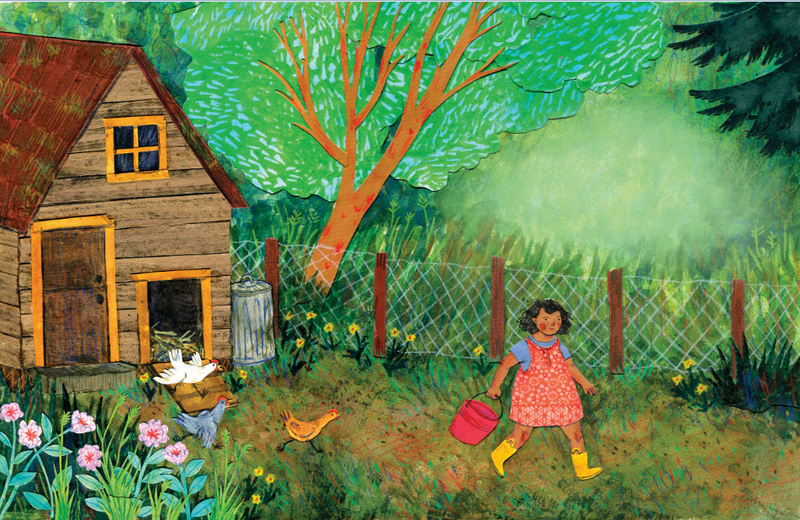 Sonya's Chickens by Phoebe Wahl (Tundra): Sonya raises chickens on her home farm, but following a deadly fox attack, she must learn to cope with loss. And with the help of her father's timely storytelling (way to use that teachable moment, pop), she receives a valuable lesson about empathy. A warm hug on a crisp morning, Sonya's Chickens is The Lion King's Circle of Life... minus the soaring orchestral arrangement. 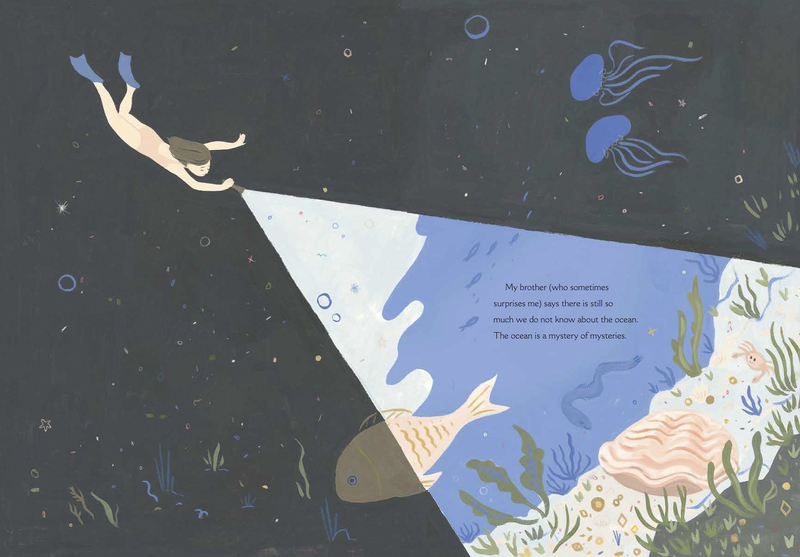 The Specific Ocean by Kyo Maclear, ill. Katty Maurey (Kids Can Press): Like the ocean itself, this book shimmers quietly on the surface but contains an unexpected depth. A valuable reminder that just because you can't take something with you, doesn't mean you have to leave it behind. To the Sea by Cale Atkinson (Disney*Hyperion): A story about the importance of being seen, Atkinson illustrates his story about friendship with a bold palette (mostly richly dark blues and radiant oranges), adding a level of high drama to this heartwarming book. Voice of Freedom: Fannie Lou Hamer by Carole Boston Weatherford, ill. Ekua Holmes (Candlewick): Told in a lyrical first person narrative by the prolific Weatherford (a master of picture book non-fiction), Hamer's inspiring life story is further elevated by Holmes' powerful artwork. 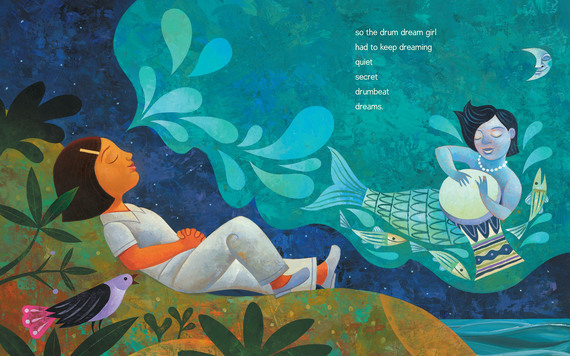 A fine artist making her debut in children's literature, her work is both grounding and transcendent, somehow taking the tactile qualities of collage and paint and infusing them with the otherworldly glow of a stained glass window. A fitting tribute to the woman known as "the spirit of the civil rights movement." Wait by Antoinette Portis (Macmillan): Similar in theme to the aforementionedSidewalk Flowers, we find ourselves again in a preoccupied and hurried world. It takes a child to remind us to slow down and notice the beauty around us. That being said, have you ever been in a hurry and tried getting somewhere with a toddler? It's adorable but absolutely maddening. I can already see the satirical version of this book from the parent's perspective called, That's Great Sweetie, But We Really Do Need to Go, So Let's Just Try to Focus and Keep Moving. One Step at a Time. There We Go, One Step at a.... ARGHHHHH!!!!! Not Another $#*(%^! BUG!!! The White Book by Silvia Borando, Elisabetta Pica, and Lorenzo Clerici (Candlewick): A child paints the walls of his room only to find that each color reveals a special secret. An absolute charmer of a book that doesn't need any words to cast its spell on readers of all ages. The Wonderful Things You Will Be by Emily Winfield Martin (Random House): Martin didn't just write a book, she took all the hopes and dreams that we have for our children and turned that into a heat-seeking missile aimed straight at the heart. 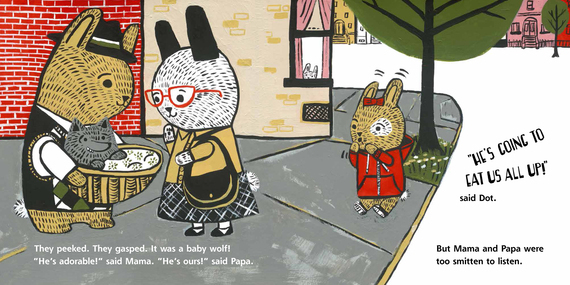 If you're in the market for a baby shower gift, look no further than this stylish book about loving someone no matter who they grow up to be.